If you’ve been a regular reader of this blog, you know that I’m not really into gadgets. I only buy those that I really need and I don’t care if I’m using an old model or not. The tablet is one of the popular gadgets today but I really have no plan on buying one because I think I don’t need it. I’m a full-time mom and if I need to be connected, I can use my laptop. One more thing, I’m scared to buy gadgets because I don’t want my son to be hooked with video games or online games and I feel that it’s too early for him to have gadgets. But I’ve been reading blogs and I’ve seen other kids using tablet, I realized that tablet is also used as an educational tool so I search for different tablet for kids and I even included them in one of my post last year “Christmas Gift Ideas for Kids”. From that moment, I was really thinking if I will buy one for my son. Leappad learning tablet is P7,999. December came and my husband told me that his officemate bought Samsung Galaxy for only P14,000 but still I did not buy any tablet because I feel that Samsung Galaxy is not suitable for my son. (baka mabasag din ang screen katulad ng nangyari sa laptop ko dati). Last week, my husband texted me about Ainol Novo 7 Paladin, the same officemate brought this tablet in their office. I searched on the internet to check the price and reviews. Then finally, the search is over. This is not our gift because we already gave him Thomas and Friends Climbing Set last Christmas, we used the money that he received last Christmas and 3rd birthday. 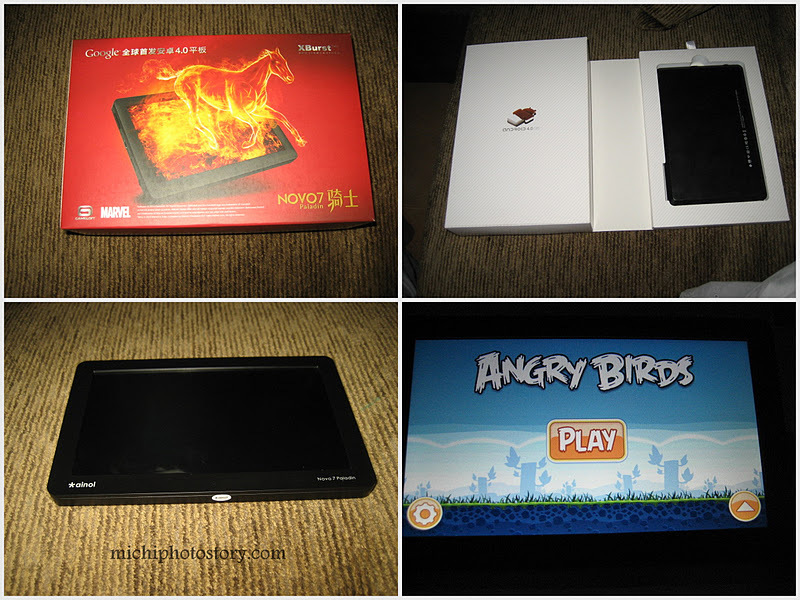 Ainol Novo 7 Paladin is only P6580, so if you have a limited budget like me, you can buy this tablet for your kids. So far, my son enjoys his mini tablet, he likes angry birds, matching games, reading words, and tracing dots. Actually, this tablet is not only for kids, it’s for everybody. ^pag nahawakan na niya, ayaw na tigilan, kaya may oras lang na pwede gamitin, pag hinahanap, sinasabi ko wala pa battery, charge ko pa. hihi! I think owning a tablet/gadget is good for children in some way. My sister bought her son an IPAD2 last december kasi she saw potential sa anak niya whenever we play a game using my IPAD 2. Infairness sis, ang bilis matuto ng bata at marunong na siya mag-english at magpalit kung english, french, korean at etc sa setting ng IPAD!! sobrang amazing talaga, nasusuprise talaga ako sa talent ng pamangkin ko na yun.. he knows how to play Nintendo DSi too! :) Thanks for sharing your post! ^i was hesitant in buying gadgets but i've realized i should not deprive my son because we are in technology era and i want him to be prepared as early as now because technology trends will just continue. Yun nga lang, like yourself minsan akala nila sa kanila na yun, hehe. Naku ang mahal naman ng Leappad dyan. Dito mga over 5K - pero mahal pa rin. sis, kay ethan talaga yung tablet kung para sa kin, yung samsung siguro bilhin ko para malaki. hehe! puro apps niya yung nakadownload dun. angry bird lang nalalaro ko. hahaha! this is cool. im planning to buy one for my son too. kaya lang sabi ng daddy nya pag nag-two na lang daw sya. im inlove with the leapad and im planning to buy that but then change my mind after i have read your post. thanks much. tin - ok naman sis, according sa review, trusted brand naman to sa china. I saw these ones while on a trip to China and yes they are lovely for kids. These gadgets will make your kid more aware of technology as an integral part of their daily lives. Super techie ng mga kids talaga lately. And the tablet is affordable! I'm thinking of getting one for myself hehe. tablets for kids ,wow. My 3 years old loves to play with DS and PSP .HE plays like the older kids but I hid it to him coz he don't want to play anymore .it makes him lazy and no exercise at all. even if it cost less ,i wont buy this stuff for my little boy. Wow! I might just get one for myself and my son. Astig. ^pwede, nakikihiram din ko minsan e. hehe! Huwaw!! I'm sure sobrang tuwang tuwa ang anak mo sa new gadget nya!H tech na talaga ang mga bata ngayon. Bat di nauso nung araw yan. hahaha! I find no question in buying a kid an educational gadget to develop his mental, psycho-motor faculties. The only apprehension I may have had if he's not being taught on the importance of using the said gadget, he may be tempted to use it to satisfy his curiosity, which in end will develop into a habit that couldn't be remedied or treated. At least, for a very reason you've provided your kid a gadget for him to be updated to the modern techies! Niregalohan ko anak ko ng vtech Dora the explorer na laptop to improve her Spanish skills. It works very well and it helps alot when we are on a road trip. sosyal na talaga mga kids, my nephew din is asking for my iPad and i said NO. i want him to learn how to value things and not just get it immediately. i gave conditions like grades if he really wants one. you have a lucky kid... for a having such a cool mom. di pa ako nakakatanggap ng ganyan na regalo hanggang ngayon... lol... Yahweh bless. Me too I am not the type who splurge when it comes to gadgets. And I thank God wala pa sa bokabularyo ng mga anak ko ang mga ganitong innovations. Though I always allow them to use one of my computers for educational purposes at pati na rin pastime. Glad you bought one for Ethan. For me, gadgets are lifesavers specially on trips. Ang downside nga lng is that feeling ni Akira sa kanya lahat yun. Once the ITouch is lowbatt, she asks for my Ipad naman. Ang daddy niya nagtitiis sa PSP. Hehehe.